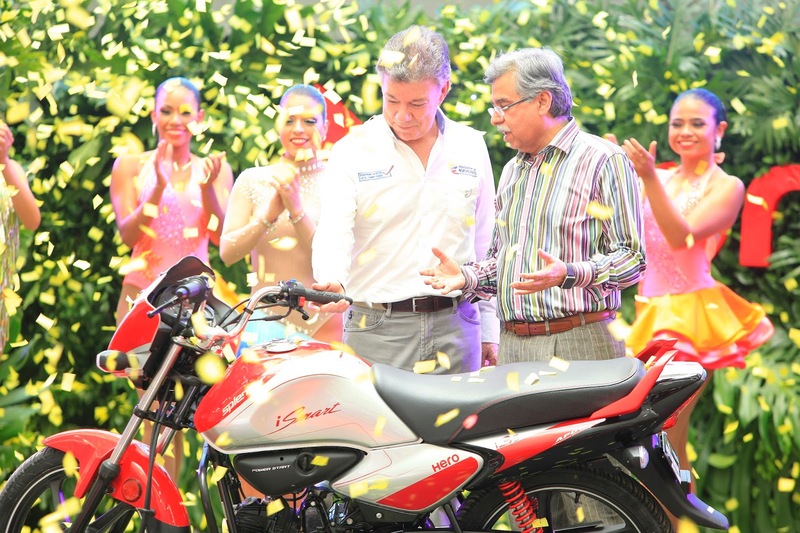 Hero MotoCorp Ltd. (HMCL), the world’s largest two-wheeler manufacturer, set a historic milestone with its ‘first’ global manufacturing facility, at Villa Rica, in Colombia going operational, here on Tuesday. Honorable Mr. Juan Manuel Santos, President of Colombia and Mr. Pawan Munjal, Chairman, MD and CEO of Hero MotoCorp Ltd. inaugurated the plant here today at a glittering ceremony attended by ministers from the government of Colombia, government officials, senior bureaucrats and Hero MotoCorp associates. Spread over 17 acres (68,000 sq meters) of land at the Parque Sur free trade zone at Villa Rica in the state of Cauca - about 500 km south-west of Bogota, the plant will have an initial production capacity of 80,000 units per annum. This capacity will be expanded to produce 150,000 units per annum, in the next phase. The plant has been built at a project cost of US$ 70 million of which US$ 38 million has been utilized in CAPEX and rest will be used as working capital over the next few years. The new plant will manufacture HMCL’s best-selling and globally successful range of motorcycles and scooters. The plant will manufacture ten products from the HMCL portfolio, including the all-new scooter Dash which was also unveiled here today as part of its global launch. With the commencement of operations at the manufacturing plant in Colombia, the New Delhi-headquartered HeroMotoCorp has become the first Indian two-wheeler manufacturer to set-up a manufacturing plant in Latin America. 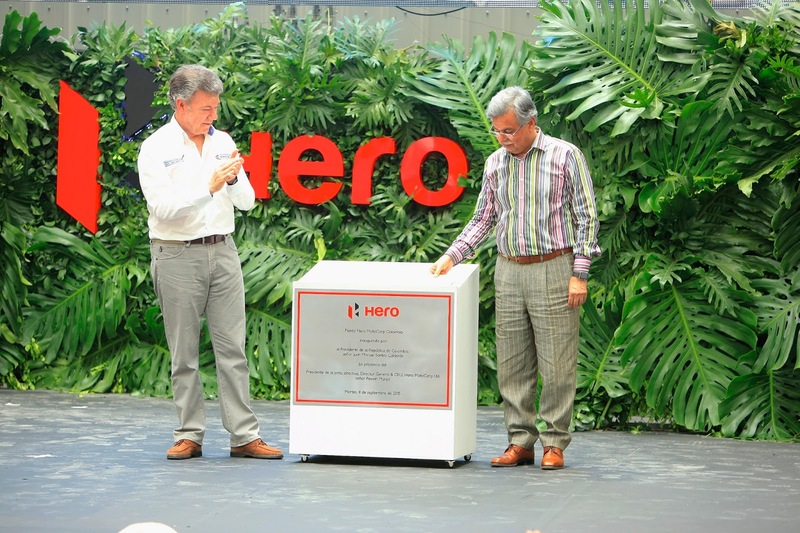 Currently Hero sells its range of two-wheelers through 160 outlets spread across 133 cities and towns in the country. Hero has rapidly augmented its network by adding 69 outlets in 2015 alone. Some of the bestselling Hero products include – the 100cc Splendor iSmart, Eco Deluxe, and Passion-Pro; the 125cc Glamour; the 150cc Thriller and the 225c Karizma ZMR. Hero is also the only two-wheeler manufacturer to offer a 4 year warranty on all its models. Hero MotoCorp currently sells its products in 24 countries across the world - Sri Lanka, Nepal, Bangladesh, Egypt and Turkey in Asia; Peru, Ecuador and Colombia in South America; Guatemala, Honduras, El Salvador, Nicaragua, Panama and Costa Rica in Central America; Kenya, Mozambique, Tanzania and Uganda in East Africa; Ethiopia in South Africa; and Burkina Faso, Ivory Coast, Democratic Republic of Congo and Angola in West Africa. In partnership with its local distributors, HMCL has also established assembly units in Kenya, Tanzania and Uganda in East Africa. With another overseas manufacturing plant coming up in Bangladesh, the company is fast building up a global manufacturing base to cater to growing demand for its products in international markets.